Black Crow's Gallery pages are organized by categories, so that the entire set of drawings does not load all at once. Links from the Gallery Index lead to each category, where thumbnails of all drawings are displayed, with links to the full-size images. 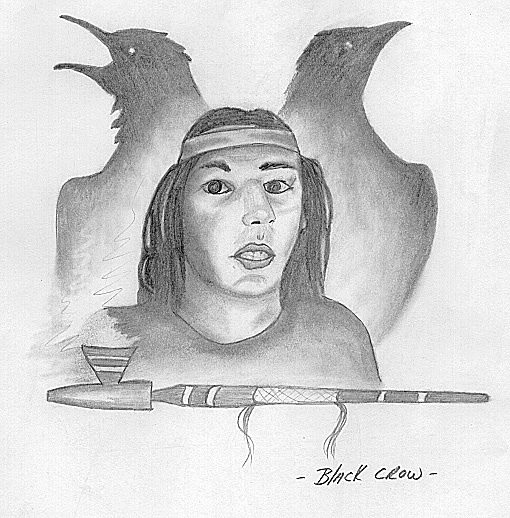 All images in Black Crow's Art Gallery are copyright protected by Chris Black Crow Bousquet. I've been doing this type of art work for about 10 years now since I've been in the Prisons of Massachusetts, so I've had a lot of practice and got pretty good with it. This Prison at Gardner has a Native Circle so you would well know I've been changing my ways of thinking and of life. You asked where I come from? Honestly I couldn't tell you. I was adopted into a White family at the age of 9 months old. Brought up by them and their ways. I always knew I was adopted but not till awhile ago did I ask if I was Native. She said Yes. I do not know from who or where do I come from. Sometimes I really wonder and would like to know. Though you know ... if I really asked these parents more it would hurt their feelings that they brought me up all this time, leading into a big thing. Right now I am very happy that the Spirit has led me here and I can practice the ways of our Ancestors, Elders and our Native Tradition. It is truly the way to live no matter where we are, not only for ourselves but for the Generations to come. Black Crow is a named plaintiff in Trapp, et al. v. DuBois, et al. [this link will open in a new window], a lawsuit for religious freedom in prison in Massachusetts. Go to the Gallery Index of Black Crow's drawings. This site was created for Black Crow by Peter d'Errico.